South Florida Sun-Sentinel/Amy Beth Bennett via Associated PressNikolas Cruz is led into the courtroom before being arraigned at the Broward County Courthouse in Fort Lauderdale, Fla., on March 14, 2018. Teenage girls and young women have been flooding the suspected Florida shooter with fan mail. Nikolas Cruz is accused of murdering 17 students and staff members at a Florida high school, and could face the death penalty. The women have sent Cruz gushing love letters, revealing photos of themselves, and roughly $US800 for his commissary account, the South Florida Sun-Sentinel reported. Like many infamous prisoners before him, accused Florida gunman Nikolas Cruz is receiving torrents of fan mail, money, and vulgar photos from teenage girls and young women across the country who say they’re attracted to him. 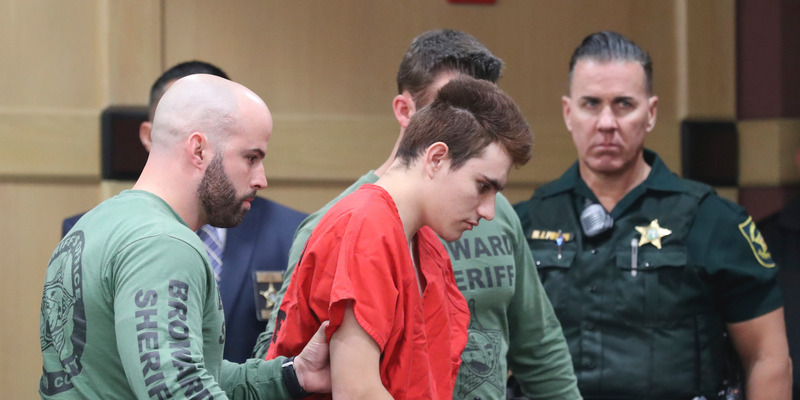 Cruz has been in jail since February 14, the day he allegedly gunned down 17 students and staff members at Marjory Stoneman Douglas High School in Parkland. Prosecutors recently announced they intend to seek the death penalty. His attorneys said they were shocked by the stacks of letters and cards he has received – many of which included pictures of scantily clad teenagers or gushing descriptions about his looks. Another woman in Chicago reportedly sent Cruz nine salacious photos, including shots of her cleavage and backside, and one of herself in a bikini eating a Popsicle. Broward County Public Defender Howard Finkelstein told the Sun-Sentinel he hasn’t seen anything like it in his 40 years on the job. Finkelstein added that about $US800, apparently from Cruz’s fans, has been deposited into Cruz’s commissary account in jail. Jail workers also reportedly open every item sent to Cruz, except legal documents, and return any “obscene” or potentially threatening mail to the senders. But despite his attorneys’ efforts, Cruz is apparently aware of his newfound fame. A prosecutor involved in a trespassing case against Cruz’s brother, Zachary Cruz, said during a court hearing she was concerned about a jail visit Zachary made to Nikolas, in which the two apparently discussed starting a fan club for girls, ABC News reported.